So my wife played this trick on me. I absolutely hate (strong word) Liver. As a Kid diagnosed with anemia, My parents made me eat liver while tears would stream down my face. This went on several times a week until I was no longer anemic. But my wife decided it was important that we find a way to get our kids to eat liver. This is what she came across. I will tell you that I absolutely loved them… Until I found they had liver in them LOL. Give them a try and see what you think. Even if you hate Liver. YOU WILL LOVE THESE BURGERS! Other ideas: like avocado, cheese, homemade mayo. Chop until it looks like ground beef. Take the chopped liver, and mix it with the bison, hamburger, bacon, onion , and your spices. Cook them on the grill like you would any other Burger. 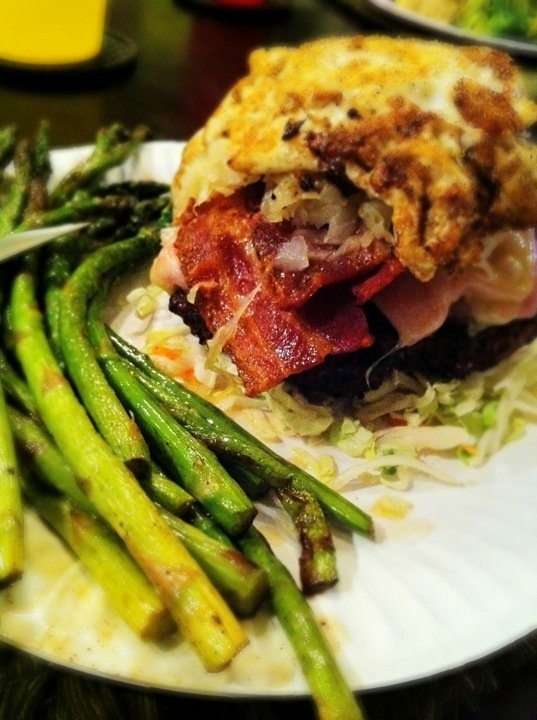 Top with ham, bacon, sauerkraut, mustard, and an over-medium fried egg.